Hair loss affects millions of individuals in the United States today. Whether it occurs suddenly or gradually over many years, hair loss can have a devastating impact on our physical appearance and personal confidence. Hair loss can usually be stopped or reversed if treated immediately. Our medical providers not only treat, but educate our patients about hair loss and prevention. Each day, we naturally shed about 50-100 hairs.Unlike daily hair shedding, hair loss, or alopecia, is indicated by significant hair thinning or bald patches. There are many different types and causes of alopecia. Some types of alopecia are temporary while others are permanent. 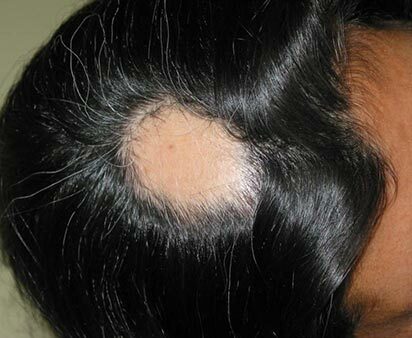 In most cases, the type of alopecia present can be diagnosed by looking at the affected skin. Rarely, blood work or a scalp biopsy may be needed for diagnosis. Treatment is aimed at correcting the cause of hair loss or preventing progression. 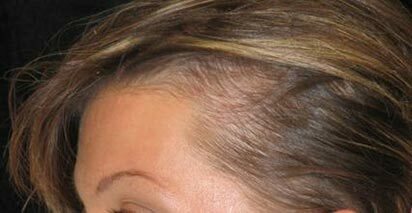 Androgenetic alopecia is the most common type of hair loss and includes both male pattern baldness and female pattern hair loss. 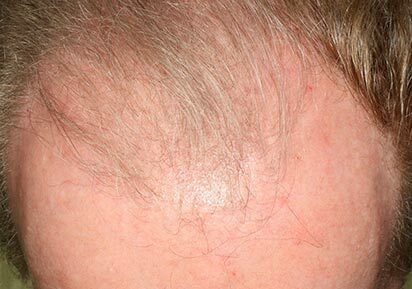 Affected males lose hair on the crown of the scalp and frontal hairline. On the other hand, affected females do not experience baldness, but notice widening of the hair part and overall hair thinning. Hormones known as “androgens” have been shown to contribute to this type of alopecia in both men and women. Other genetic and environmental causes are suspected to contribute as well. Treatment is possible to prevent progression of hair loss. Alopecia areata is a type of cyclical hair loss caused by an autoimmune phenomenon. It temporarily causes round patches of complete hair loss, typically on the scalp or beard area. In some cases, this condition can progress and cause complete hair loss on the entire scalp (alopecia totalis) or body (alopecia universalis). Fortunately, alopecia areata does not permanently damage the affected hair follicles. After the body corrects the autoimmunity, which may take months to years, hair regrowth is possible. Treatment is possible to encourage faster hair regrowth. Telogen effluvium is a type of temporary hair loss caused by a sudden shock to the body. This shock can be caused by a traumatic event, stress, illness, pregnancy, or new medication. The shock pushes hair follicles from the growth (anagen) phase or transition (catogen) phase into the resting (telogen) phase. Hairs in the resting phase are shed after 6-8 weeks. Therefore, hair loss from telogen effluvium occurs about 2 months after the shock. Once hairs are shed, the follicles return to the growth phase and new hair begins to form. Although no treatment is needed for telogen effluvium, it is important to identify the cause of the shock so that it can be corrected if necessary. Traction alopecia is a type of hair loss caused by chronic tension on the hair. It typically affects the scalp after years of wearing tight hair styles, such as tight ponytails or braids, or heavy hair accessories, like hair extensions. 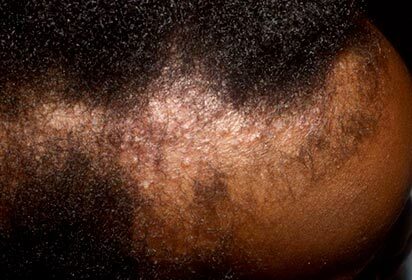 This traction causes inflammation around the hair follicles which leads to hair loss that can be permanent in some cases. Treatment is necessary to reduce inflammation and promote hair regrowth. Cicatricial alopecia, or scarring alopecia, is a type of permanent hair loss. While there are several different types of cicatricial alopecias, they all share a similar pathogenic mechanism. Inflammation within the skin destroys the hair follicles and scar tissue forms in their place. Once a follicle is destroyed, it cannot regrow hair. Treatment is possible to reduce inflammation around undamaged hair follicles and maintain their ability to grow hair. Medication – chemotherapy, radiation, etc. When possible, treatment options aim to correct the underlying cause of the hair loss. Our providers utilize a combination of the following medications to promote hair regrowth and slow progression of hair loss. Hair restoration procedures are not limited to hair transplantation. Our providers do not perform hair restoration procedures, but can refer you to an accomplished specialist. Corticosteroids are delivered directly to the area of hair loss via topical application or intralesional injection. They help to reduce inflammation and relive symptoms of itching or burning. This can prevent destruction of hair follicles and stimulate hair regrowth. Minoxidil, more commonly known as Rogaine ®, is a topical medication that holds onto hair and prevents progression of hair loss. It is typically used to prevent progression of androgenetic alopecia in both men and women. It must be used twice daily for best results. If minoxidil is discontinued, the hair loss progresses. Finasteride, also known as Propecia, is an oral medication that slows the progression of male pattern baldness. It decreases the amount of DHT, a hormone that contributes to male pattern hair loss, in the scalp and blood. *** include side effects? Aldactone, also known as spironolactone, is an oral medication that slows the progression of female pattern hair loss. This medication reduces the production and inhibits the function of androgen hormones that contribute to female pattern hair loss. *** include side effects? One important way to prevent hair loss is to maintain good overall health by exercising regularly and eating a protein rich diet. Gentle hair care habits can also help to prevent hair loss, such as avoidance of tight hair styles, avoidance of excessive or rough brushing, and decreasing the amount of heat and harsh products applied to the scalp.